Is Your Tongue Hard to Control? Thank you for visiting Scripture Prayer for the Tongue. To fully understand the principles of praying scripturally, please read the teaching “Why Pray Scripture?” . Hearing God: As it is rare to hear an audible voice from God, one of the ways God will speak to us is through His written Word and a small still voice inside us. Before reviewing the scripture references below that address what the Bible says about controlling the tongue ask the Holy Spirit of revelation to join you. When certain verses capture your attention more than others, meditate and incorporate those into your personal daily prayer life. Heavenly Father, we ask You to give complete knowledge of Your Will to this reader, and to give him/her Your spiritual wisdom and understanding as they seek You with all their hearts and lean not on their own understanding. In Jesus’ name we pray. Amen. If I can speak in the tongues of men and even of angels, but have not love (that reasoning, intentional, spiritual devotion such as inspired by God’s love for and in us), I am only a noisy gong or a clanging cymbal. And if I have prophetic powers (the gift of interpreting the divine will and purpose), and understand all the secret truths and mysteries and possess all knowledge, and if I have sufficient faith so that I can remove mountains, but have not love (God’s love in me) I am nothing (a useless nobody). Even if I dole out all that I have to the poor in providing food, and if I surrender my body to be burned or in order that I may glory, but have not love (God’s love in me), I gain nothing. You created the universe when You spoke it into existence with the words of Your own mouth. Your words are almighty and powerful. And now You say there is power in the words that I speak for I am created in Your image. Help me to be careful and responsible with my mouth, to be quick to hear, slow to speak, and slow to anger. You tell me in Your Word that blessing and cursing come from the same mouth—that even a fountain does not spout fresh water and bitter water from the same spout. And, yet, with my tongue I bless you, Lord, and with it I curse men who are made in Your likeness. Forgive me, Lord, for my untamed tongue that is so often full of poison. Change my heart, Oh Lord, for out of the abundance of the heart, the mouth speaks. 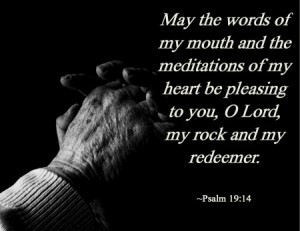 Help me, Lord, for You have said that life and death are in the power of the tongue. Forgive me for being critical, judgmental, sarcastic, rude or unkind with my words. Help me to speak life and encouragement to those around me. Help me to walk in love always offering words of kindness, love, and grace so that I do not grieve the Holy Spirit. Help me to be wise and use my tongue to speak healing words because a gentle tongue is like a tree of life, and I don’t want to crush other people’s spirits. Put a watch guard over my mouth and keep me from trouble. Teach me to know when to speak and when to be still or pray. And when I speak, help me to speak the truth in love. I don’t want my service to You to be worthless because I cannot bridle my tongue. I want to mature and keep my lips from evil. I trust you Lord, to cause me to desire and to do Your will and to cause my thoughts to become agreeable to Your will. I thank you for Your grace for me, Lord, and I give You all the glory for the changes You bring in my life by Your Holy Spirit. Scripture Prayer for the Tongue was written to lift up and encourage the body of believers; sharing your testimony is one of the ways that we continue to overcome the enemy. If this teaching on Scripture Prayer for the Tongue has impacted your life, we invite you to share your testimony. Scripture Prayer: Why Pray Scripture?